Last month, European Space Agency’s Envisat was nearly on the receiving end of a spent Chinese rocket stage. BRECKENRIDGE,Colo. — The already untidy mass of orbital debris that litters low Earth orbitnearly got nastier last month. Ahead-on collision was averted between a spent upper stage from a Chinese rocketand the European Space Agency's (ESA) huge Envisat Earth remote-sensing spacecraft. Space junktracking information supplied by the U.S. military, as well as confirmingGerman radar data, showed that the two space objects would speed by each other ata nail-biting distance of roughly 160 feet (50 meters). ESA'sEnvisat tips the scales at 8 tons, with China's discarded rocket body weighingsome 3.8 tons. A couple of tweaks of maneuvering propellant were used to nudgethe large ESA spacecraft to a more comfortable miss distance. Butwhat if the two objects had tangled? Sucha spacecollision would have caused mayhem in the heavens, adding clutter to anorbit altitude where there are big problems already, said Heiner Klinkrad, headof the European Space Agency's Space Debris Office in Darmstadt, Germany. Itturns out, Klinkrad told SPACE.com, that 50 percent of all the closeconjunctions that Envisat faces are due to the lethal leftovers from China'sJanuary 2007 anti-satellite test, as well as chunks of junk resulting from lastyear's smashup between an active U.S. Iridium satellite and a defunct RussianCosmos spacecraft. 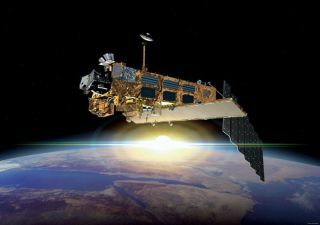 Klinkradjoined several orbital debris experts that took part in the 33rd AnnualGuidance and Control Conference organized by the Rocky Mountain Section of theAmerican Astronautical Society. The five-day meeting began Feb. 5. Significantprogress has been made by the U.S. and the international aerospace communitiesin recognizing the hazardsof orbital debris, reported Nicholas Johnson, chief scientist for orbitaldebris at the NASA Johnson Space Center in Houston, Texas. Johnsonadded that steps are being taken to reduce or eliminate the potential for thecreation of new debris. However, "the future environment is expected to worsenwithout additional corrective measures," he noted. During2009, Johnson reported, five different NASA robotic spacecraft carried outcollision avoidance maneuvers: a Tracking and Data Relay Satellite (TDRS-3),Cloudsat, Earth Observing Mission 1, Aqua, and Landsat 7. Also, the spaceshuttle and the International Space Station took collisionavoidance actions, he said. Theworst thing that could happen, according to ESA's Klinkrad, is theInternational Space Station (ISS) receiving a fatal hit. The space station iscurrently home to five astronauts representing the U.S., Russia and Japan. "Apenetrating object hitting the ISS, and possibly causing a casualty onboard . . . Ithink that would be the most dramatic case we could have," Klinkrad suggested.Such an incident might turn public opinion against human spaceflight, he said. Onebit of good news in all this orbital riff-raff. Dueto last year's satellitecrash between the Iridium and Cosmos spacecraft, Johnson explained that theJoint Space Operations Center (JSpOC) of the U.S. Strategic Command now conductsconjunction assessments for all operational spacecraft in Earth orbit,regardless of ownership nationality. "Tobe honest, a year ago, we couldn't even have hoped to have done this," Johnsontold SPACE.com. "It'sreally a consequence of the collision last year. People have been talking aboutthis for years. But now we've made the commitment . . . that this is something thatneeds to be done and can be done relatively easily," Johnson said. Klinkradconcurred. "The collaboration is getting even closer now," he said. Playingdodge ball with high-speed space debris is one tactic. But there is also a growinginterest in removing the most troublesome objects — perhaps an annual quota ofsome sort. Targetedwould be specific inclination bands and altitude regimes, Klinkrad said. Butprior to implementing debris remediation measures on a global scale, technical,operational, legal and economic problems must be overcome. Klinkradand NASA's Johnson provided a wearisome appraisal of the future. Evenwith an immediate halt of launch activities, spacefaring nations will bedealing with an unstable low-Earth orbit environment in some altitude andinclination bands. This would be a consequence of about 20 catastrophic collisionswithin the next 200 years, the two orbital debris experts explained. Someorbit altitudes already have critical mass concentrations that will trigger"collisional cascading" within a few decades, unless debris environmentremediation measures are introduced. Theidea of debris creating debris was put in motion by Donald Kessler, along withfellow NASA researcher, Burton Cour-Palais, back in 1978. Theirresearch suggested that, as the number of artificial satellites in Earth orbitincreases, the probability of collisions between satellites also increases.Satellite collisions would produce orbiting fragments, each of which wouldincrease the probability of further collisions, leading to the growth of a beltof debris around the Earth. Now,decades later, that prophecy has been dubbed the Kessler Syndrome. Kesslertold SPACE.com that the disorder fits into much more complex natural laws thatinclude the evolution of the solar system, as well as meteoroids, meteorites,and climate-changing asteroids. Kessleris now an orbital debris and meteoroid consultant in Asheville, North Carolina. "Thereis nothing complex about what is called the ?Kessler Syndrome' . . . it is just theway nature may have converted a disorderly group of orbiting rocks into anorderly solar system . . . although nature reminds us with a large asteroid or cometcollision every few million years that it isn't quite finished yet. ? "Inthe case of orbital debris, this collision process is just starting," Kesslerexplained.? Consequently,nobody should be surprised that as orbital debris models became more complex —and as more data is obtained — the same conclusion holds, Kessler said. "Thefuture debris environment will be dominated by fragments resulting from randomcollisions between objects in orbit, and that environment will continue toincrease, even if we do not launch any new objects into orbit," Kesslerconcluded.